The worlds largest freshwater lake is America’s third Ocean. 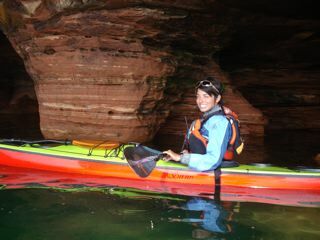 With 'the beautiful couple', Damon & Sarah Smith, we squeeze through tiny arches and tunnels in the Apostle islands, and paddle under the impressive overhanging multi-coloured Pictured Rocks. Highly commended at the Waterwalker Film Festival. 8 minutes. 159 MB. 16 x 9 widescreen.